Two recounts were called for in Sunday’s Furzton summer league round such was the margin between the top three. Little more than a pound separated the top three individuals; and it took TWO countbacks on weight to split the top teams following a points tie. Tackle Hub Gold’s Paul Chapman won with 28-11 of bream on the tip as Black Horse Black’s Rob Dzialak included a 17-12 carp in his 27-4 while, at the next peg, ‘Hub Platinum’s Phil Bardell had to settle for third on 27-1. Maver MK Green triumphed over 'Horse Black – following an agonising wait – after a second countback revealed they'd totalled 67-8 to Black's 66-2. With just one round to go that leaves 'Horse on 38 series points, MK on 48 and 'Horse red with 55. MARK 'Guinness' (apparently so dubbed because of his fishing shirt) hit the sweet spot on Black Horse – landing two 150lb bream bags. Also reported through Water's Edge, several carp to 28lb have been caught from Heron. A TRIP to Toddington saw Richard Bryant net 100lb of carp, the last fish of which broke his pole. 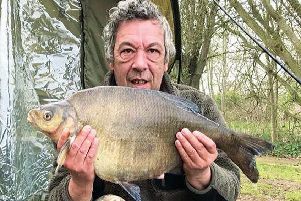 Jamie Boomer had a 9-12 Bradwell Lake Bream while Arthur Terrill missed Willen South's bream but did have a PB 2lb perch. Owen Wye had eight carp and lost three on Wolverton Mill. A BIG Pit session saw Keith Bowler net slabs of 6-5 and 5-12. Newport's Abbey Pits working party attracted several of the club's Eastern European members whose hard work was welcomed with open arms. OSPREY, Lakeside: Chris Lovelock 105lb, Neil Hutchins 71lb, Ed Blane 49lb. TOWCESTER (with Nene) on Barby Banks: Kevin Elliott 93-8, John Broughton 84-2, Mick Goodridge 60-14. MK Vets, Canons Ashby: Bob Gale 59-10, Steve Chilton 29-9, Paul Chapman 26-7. KINGFISHER, Clattercotte: Keith Harrison 27-12, Mircea Peredercu 25-5, Craig King 19-10. CALVERT, Claydon Lake: Ben Holdaway 16-5, Dave Lewis 6-13, Barry Witteridge 5-7. LONG-awaited site road repairs are due to start at Brad'll Lake on August 21 (five days) with the help of a £5,000 EA grant (rod licence money) channelled through the Angling Trust. FIXTURES: Sat (Aug 12) Furzton A & B closed for individual league round, 01234 713144 t enter; Aug 20, Lodge and Tear Drops closed for match; Aug 27, open on Black Horse Lake, 01908 690969. FURZTON Festival opens: Aug 23, Ken Ball (over 55s) 01908 565446; Aug 26 float only and, Aug 28, Frank Swan – GoneFishin 01908 313158 for both.